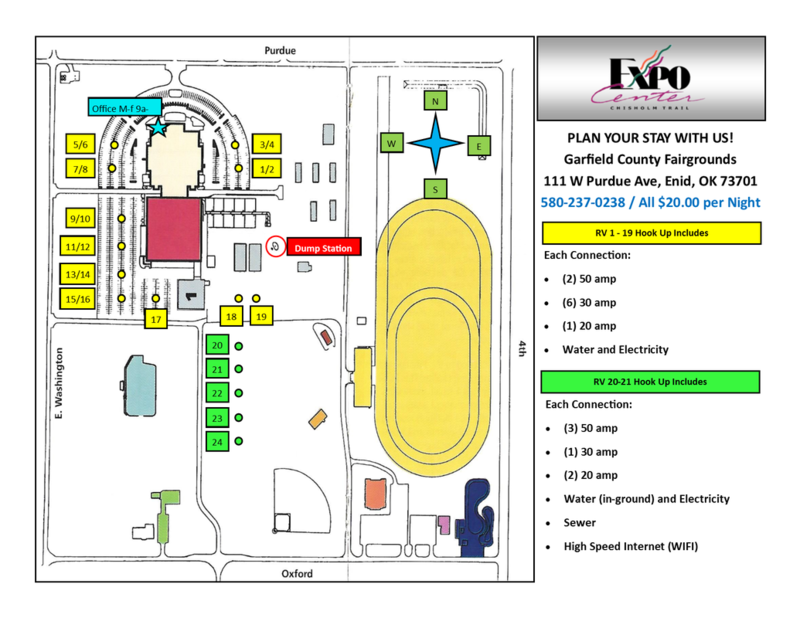 RV Park & Rental Information - WELCOME TO THE CHISHOLM TRAIL EXPO CENTER! Stay with us on the Garfield County Fairgrounds! Whether your traveling with a trade show, concert, or any other event being held here at the Chisholm Trail Expo Center, or you just need a place to rest while traveling through, we invite you to stay with us! NOTE: To access water from the hook-ups on the concrete, you will need to stop by our office to get a water key to turn the water on. All spaces are available first-come, first served. No reservations required (or taken). All spaces rent for $20.00 per night. Let us know you're here, and how many nights you will stay. Stop by our office to pay when you are headed out! Concrete (YELLOW) Sites Closed August 20-26, 2018 due to Outdoor Event. Grass Sites (GREEN) Open - first, come - first served. No Reservations.